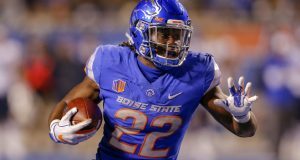 It appears the theme of this year’s draft, like last year, is the high-end quality of running backs. Many rookie mocks have upwards of five consecutive RBs taken before a wideout comes off the board. This will create value for dynasty owners, and allow them to grab their favorite wide receiver with a mid to late first round rookie pick. Unlike the RB position, which has a clear #1 in Saquon Barkley, the WR group is a much more muddled mess. There are many players vying for the 1 spot. Without knowing who these prospects will be catching passes from next year, one WR stands slightly above the rest. For me, that person is James Washington. Washington arrived in Stillwater as a 3-star recruit from Texas. He quickly earned playing time which he parlayed into immediate production. By the end of his fourth season, Washington became one of the best WRs in Big 12 history. When you turn on his tape, it is easy to tell where Washington wins, DEEP BALLS. His career Yards Per Reception(YPR) was an outstanding 20.2, which ranked in the 94th percentile. He regularly creates separation on go routes which is the stable of his game. Washington can climb the ladder and is good at high pointing the football. He is able to make mid-air adjustments leading to many contested catches. He excels at tracking the ball while it is in the air. His QB Mason Rudolph had a tendency of chucking the ball up and allowing Washington to go make a play. He also does well with breaking press coverage and shines no matter what coverage he faces. This was evident in Mobile while at the Senior Bowl. Washington routinely created separation and really put on a show during each practice session. Unfortunately, Washington did not put on a display during the actual game. Despite his limited game usage, Washington impressed many scouts during senior bowl week. According to Pro Football Focus(PFF), James finished 3rd among draft-eligible wideouts in yards per route run(YPRR). If you are not familiar with YPRR it is simply a way to quantify how involved and productive a player is within a given offense. This shows us just how efficient he is. He sees the ball, he catches the ball. His 5.8% career drop rate ranked just ahead of both Calvin Ridley and Anthony Miller. He also finished the season with the 5th highest grade among wideouts given by the PFF. When on the field Washington finds a way to produce. For many, myself included, wished the combine would create separation between some prospects. For the most part, my rankings remained the same, minus two differences. 1. Calvin Ridley moved into my 2nd tier. 2. D.J. 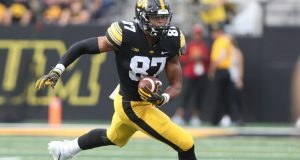 Moore clearly cemented himself as a tier 1 WR. Washington performed in a mediocre fashion, finishing middle of the pack in most events. Despite this, he did not hurt himself enough to fall down my rankings. Another reason Washington sits atop my ranking list is his profile over at Player Profiler. Although Washington did not test well, he still finished with a speed score in the 60th percentile. Washington is a player who plays faster with pads on. This combined with his explosive first move leads me to believe his game will translate to the NFL. His college dominator ranking was slightly above average showing how productive he was. In both YPR and breakout age he posted phenomenal numbers. Lastly, look at his best comparable player, DeAndre Hopkins. Player Profiler does miss on some prospects but also have a strong track record of picking successful NFL players. Many people question if James Washington can be anything more than just a vertical threat. During his time at Oklahoma State, Washington failed to run a full route tree. Instead, he primarily ran Go routes and Out routes. On the limited plays, he was asked to run other routes, he was able to effectively. He ran nice, quick, crisp routes. He sets up defenders with a head fake to the opposite side at the top of his stem. He plays against weak BIG 12 cornerbacks. At the senior bowl, he was asked to run a more varied set of routes and looked comfortable against the all-star competition. He continuously beat corner after corner in the 1 V 1s. This shows he can beat the best coverage men. Some people doubt at his size he can be a true #1 for his team. What Washington lacks in height he makes up for it with his arm length. At the combine, his arms measured 32 3/8 inches. This ranked in the 67th percentile and helps explain his contested catch success. On tape, he looks like an RB due to his thick frame should hold up well in the NFL. While James Washington may be an incomplete prospect, he very well maybe this year’s best WR. Washington needs to be groomed and taught the nuances of a route tree. Depending on his landing spot I believe he can develop into a team’s number one. His production and deep ball ability is unmatched in this class. Washington is able to change games with one play by hitting home runs. He not only catches deep balls, he typically scores when he does. Washington finished his career with 40 total TDs. His best comparable of DeAndre Hopkins is very intriguing and promising. His proven hands and contested catch ability proves he can win on 50/50 balls. While Washington is leading the pack at this moment, I must admit these ranking are fluid. Meaning the top 5 wideouts are all close for me. Landing spot could move these guys around within the tier. But for now, James Washington is my WR1.